Welcome to Tiffany Lamps UK, stockists of a wide range of Tiffany style and Art Deco lighting, lamps, pendants and shades all fixtures are hand manufactured following Louis Comfort Tiffany traditional methods. We are constantly updating and adding to our website, so do visit us again to take advantage of any special offers. All Tiffany’s favourite nature themes appear in our Tiffany lamps and lighting including peacocks and dragonflies, trees in blossom, trailing flowers and brilliant blooms. The lighting shades are worked with a strong contrast of stained glass, whilst the bases are formed like tree trunks, roots or lily pads, each combining with the other to form a stunning and satisfying whole. Many of the outstanding Tiffany lighting designs were by women. 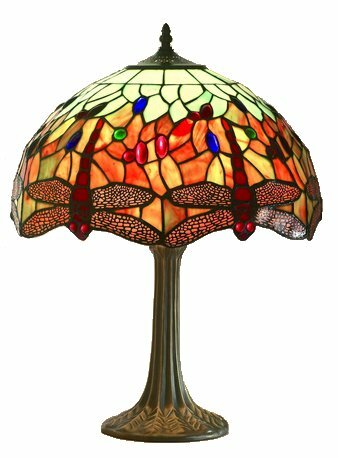 Perhaps the best known, the dragonfly Tiffany lampshade was designed by Clara Driscoll in 1900, whilst the wisteria Tiffany lamp with its random edged shade and multicoloured mosaic intricately leaded, was the work of Mrs. Curtis Freschel in 1902.